Geographx mapsmiths have created a stunning range of 3D maps of the nine Great Walks of New Zealand (5 currently available). 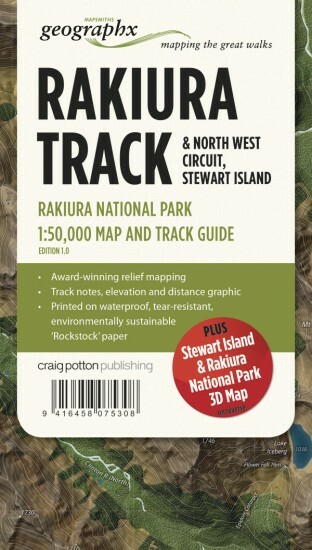 Featuring relief mapping, track notes, elevation and distance graphics. Printed on waterproof, tear-resistant, environmentally sustainable Rockstock paper. All these maps are $24.90 each. Situated at the top of the South Island of New Zealand, the park separates Golden and Tasman Bays. Its mild climate and high sunshine hours ensure Abel Tasman remains an attractive place to visit at any time of year � truly a park for all seasons. The Heaphy Track is located in Kahurangi National Park in the north-west of the South Island and is the longest Great Walk at 78.4 km. This 3-4 day, 60km circular track traverses spectacular scenery in Fiordland National Park and is easily accessible on foot from Te Anau. The Kepler Track takes you from the shore of Lake Te Anau to spend a night high above the clouds at Luxmore Hut (1085m). The Milford Track traverses an outstanding cross-section of the mountainous landforms which make up Fiordland National Park. Follow in the footsteps and marvel at the feats of early explorer Quintin Mackinnon, as you walk the length of this 53.5 km historic route. The Routeburn, Caples & Greenstone Tracks straddle the Humboldt and Ailsa Mountains where Mount Aspiring and Fiordland National Parks meet along the main divide. Tongariro was the first national park in New Zealand and the fourth in the world. It is also a dual World Heritage area, a status which recognises the park's important Maori cultural and spiritual associations as well as its outstanding volcanic features. Lake Waikaremoana is situated in the heart of Te Urewera National Park, on the eastern side of the North Island. The lake shore track is a 3 - 4 day, 46 km track through native rainforest. The Whanganui Journey passes through Whanganui National Park, in the south-west of the North Island, and is very accessible from State Highway 4 (SH4).